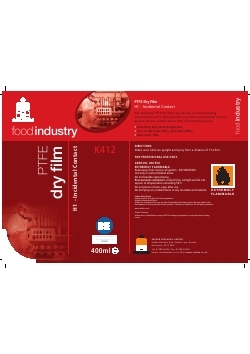 A NSF registered PTFE Dry Film Lube for use in food processing environments and is formulated for use where conventional oils and greases are not suitable due to their dirt attracting nature. Food grade PTFE - Exceptionally versatile lubricant - Very clean in use - Non-toxic - Light dry film spray - Does not attract dirt - Compatible with most materials - Safe for use where incidental contact with food may occur - Excellent anti-stick properties - Temperature range -20ºC to 270ºC - Chlorofluorocarbon (CFC) free aerosol - Economical in use - Easily directed spray - 400ml aerosol. Shake well, hold can upright and spray from a distance of 15-25cm. Pressurised container.Store out of direct sunlight. Temperature must not exceed 50oC.